This past Saturday night I had the most wonderful experience as a resurfacing surgeon. I got to play ice hockey with one of my resurfacing patients who is six months out from his surgery. He skated better then I did and it was great playing on a line with him. It truly was one of those special nights that I will always remember. I know that Tom was happy as well. It is really gratifying to see patients get their life back and return to what they love to do. It is even better when I get to share the experience with them. 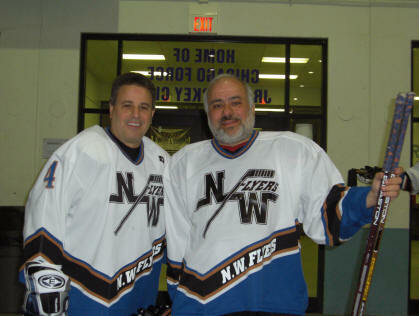 Thanks to Tom for inviting me to play with his team the NW flyers. They are a great group of people. The take home message is that a resurfacing should allow a return to a normal life and the activities you love. Is an MRI required to determine AVN? surgery that your bone won’t support a resurf and go with a MOM THR. he didn’t tell you about that you are likely a good resurf candidate. Rather then speculate I would just contact your surgeon and ask. AVN with good results so don’t worry about that. anatomy and the head size selected to match). How much is reamed from the hip for the acetabular cup? outside diameter to fill the acatabulum. Typically in a THR you ream about 3-6 millimeters larger then the actual acatabular size to get to good bone then fill the inside of the shell with polyethylene to an inside diameter to match the femoral component being used. In a resurf or a big head metal-metal THR the inside of the acatabulum is 6-8 mm smaller then the outside diameter and that is how much bone is reamed. The size in a resurf is dictated by the femoral neck size which determines the femoral head size (in M-M THR the acatabulum is selected on anatomy and the head size selected to match). All that said you see that reaming and acatabular size are esentially the same for all types of implants. Hope that makes it clear. retain as much as possible and still be able to do the job. resurfacing as compared to a THR? implants so there is minimal difference on that side of the joint. last week and listened with great interest to the discussions on this topic. the components with the available instruments. blood supply to the femoral head. reaming over the pin and once one learns how to do this it works well. the early cases while allowing a surgeon to gain experience and confidence in conventional pin placement. after I give it a try. was a tad short to begin with. With a resurf there is not much ability to alter the leg length so it more likely the feeling then an actual significant lengthening. Give it some time and the feeling usually will disappear. Many cysts can be seen on plain x-ray. For 3-D analysis a CT scan is much better then an MRI but rarely needed. If no cysts are seen on x-ray it is unlikely that clinically significant ones will be seen at the time of surgery. When I encounter larger cysts on x-ray I will sometimes get a CT but usually not. I will instead inform the patient that the cysts may make a resurf impossible depending on the size and location of the cyst. A final decision is made in surgery. Most cysts can be bone grafted or if smaller filled with cement. If cysts large enough to prevent a resurf are encountered then I proceed with a mig head M-M THR using the same acatabular component as for the resurf. Only once have I been surprised and needed to do a THR unexpectedly and that was a superior neck cyst that was hidden under an osteophyte. The other times I needed to go with a THR intraop I had predicted it on the pre op x-rays and counseled the patient accordingly. As a patient I wouldn’t worry about it because the anatomy is what it is. The anatomy will dictate the course us surgeons need to take. Just get a surgeon you trust and who is a fan of resurfs and let them do their job with the best judgement they know. What can cause a dislocation? From the sound of things I would expect her implant is not positioned correctly. This could have been because of improper placement at surgery or if a hemispherical cup without pegs was used it is possible for the cup to rotate and become misaligned later on. I would first get digital copies of her films or take digital photos of her films and e-mail them to one of us who give e-mail consults. It would be unlikely to have dislocations of a resurf for another cause. In view of that a hip spica seems unlikely to solve her problem. She might benefit from a brace that keeps her from getting into a position where the hip can dislocate while the situation is studied but these are usually not comfortable enough to provide a long term solution. Usually revision is required. If the problem is on the cup side it may be possible to revise that and still keep the resurf. Can I have an MRI after I had a hip resurfacing? areas right near the implants but no harm will come to the implants or the surrounding bone. Pacemakers are another story and are not safe with MRI. Other things that can be problematic are metal filings in the eye and vascular clips placed within 6 months. next 99 prior to reaching 100.
without doing the cases. It is a very difficult issue for a surgeon. answers. If you don’t have a good feeling look elsewhere. If you personally set a minimum number of cases for your surgeon that’s fine. But please don’t insult the surgeons starting out by claiming them to be bogus. very seriously and I feel the majority of the orthopods do. unsteadily before we learned to walk well. Thanks for reading this ramble.